One might think that composers of electroacoustic music have much in common with nuclear physicists. Plenty of forbidding images arise – for example, those of "mad scientists" in clinically spotless labcoats speaking a language that only they can understand, and cackling over projects whose merits one needs to be equally brilliant to comprehend. After all, "fun" is not the first word that comes to mind when one thinks of this musical genre. 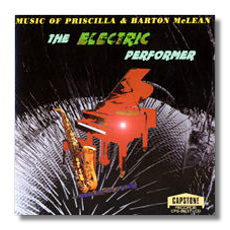 Then one becomes aware of the work of Barton and Priscilla McLean, a husband and wife team based in Petersburgh, New York, whose electroacoustic music is… well, different. Together, they are known as "The McLean Mix," and their literature describes them as an "Electroacoustic Music/Media Duo." Bringing their work to a non-traditional (that is, a non-concert-going) audience is important to them, and they promise "sounds and sights so unusual that you the audience will want to get up and perform and dance and paint…" Disney's Epcot Center was never like this. 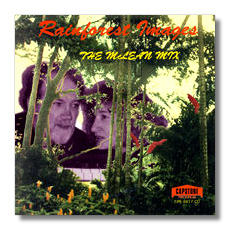 The McLean Mix can recreate a jungle in Borneo, a rainforest, or a desert spring in a small performance space; participants can play acoustic and electronic instruments, sing on a sound processed microphone, immerse themselves in slide and video images, and move their bodies in response to the rich banquet of sights and sounds. As you might have gathered by now, the description "environmentalists" also belongs to Priscilla and Barton McLean, although they might not explicitly identify themselves as such. To "Save The Rainforest" is a noble goal few would argue against, but it is too abstract to mean much to most people. The McLeans' interactive multimedia performances bring rainforests and other vulnerable environments to the audiences, and, if the music alone is anything to go by, it would be very difficult not to become emotionally involved in the spaces that are so vividly evoked. Truly, there are universes in the compound eye of a bee, the McLeans seem to be telling us. These four CDs are always surprising and provocative. They contain several types of sound. First, there's straight-ahead acoustic performance, as in the sound of a clarinet, saxophone, or human voice. Sometimes, the instrument will be manipulated during performance; Priscilla McLean "prepares" the piano in the style of John Cage with wedges, washers, credit cards (! ), and other timbre-altering objects, and the inside harp may be played as well as the keyboard. A good example of this is in The Inner Universe, a suite inspired by electron micrographs of plants and animals. 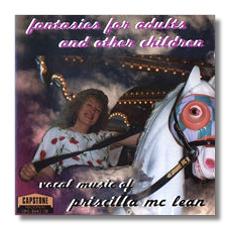 Fantasies for Adults and Other Children (a set of songs to texts by e.e. cummings) makes even more dramatic use of a prepared piano. Another manipulated instrument is the "clariflute," which is a soprano recorder with a clarinet mouthpiece; it can be heard in Dawn Chorus, Earth Music, and in other works on these four discs. The McLeans don't use electronics gratuitously, then; in Wilderness, Priscilla McLean (who has a fine soprano voice) adds reverberation to her voice with nothing more high-tech than an empty mayonnaise jar. She, it must be said, is a brilliant practitioner of what sometimes is called "extended vocal technique." Her whoops, shrieks, mutters, and palette of noises, guttural and otherwise, will endear her to anyone who loved Cathy Berberian's virtuosic performances of extreme 20th-Century music (particularly Luciano Berio's). Fans of Meredith Monk will be comfortable here too. The McLean Mix frequently accompanies "live" instrumentalists or vocalists with pre-recorded stereo tape. In the funny and frightening Where the Wild Geese Go, the tape contains samples of the clarinet soloist's own playing, and so a virtual duet for one is made possible. The tape also contains samples of animal sounds (birds and bees) and percussion samples. In Barton McLean's Dimensions, the pianist (Dimensions II) or saxophonist (Dimensions III) plays along with pre-recorded piano or saxophone samples that have been processed, sometimes – as in the case of the piano in Dimensions II – past the point of recognition. Priscilla McLean's Dance of Shiva incorporates pre-recorded samples of everything from Buddhist chants and Hildegard von Bingen to bumblebees to evoke the Hindu deity Shiva. In concert, multiple slide projections depict "volcanoes, landslides, glaciers, storms, […] peoples and animals appear, flower, and disappear in a continuous lifeflow cycle, on and on forever." (It is time for The McLean Mix to consider a DVD of their work; to a certain extent, perhaps these CDs are already outdated!) Further multicultural ambitions are revealed by In the Beginning. In this work, one of the most recent on these four CDs, Priscilla McLean reads creation texts from Babylonia, Greece, and Chaldea, and also draws upon Hindu, Arunta, Zuni, and Occidental cultures. This work contains some of the most complicated manipulation of live and pre-recorded material. As she sings "live," her husband alters her voice with echo- and delay-processing. The tape that is played simultaneously contains almost nothing but her voice, but extensive manipulation via the ASR-10 synthesizer dramatically alters its range and the timbre, even creating choral textures. These are not the only unusual sounds to be heard on these discs. In the joint composition Rainforest Images, the McLeans have written for didgeridoo, the wind instrument created by Australia's indigenous peoples. The spokes of a bicycle wheel are bowed and struck with dampers in On Wings of Song, which also gives wonderful prominence to the pre-recorded "voices" of mosquitoes and bees. Even ancient glacial rocks are found to be highly musical; they are struck with mallets in Earth Music. Lest the impression be given that this is New Age music for softy-eared tree-huggers, I need to say that the McLeans don't seem to feel any obligation to make traditionally pretty noises. This is not music to be lulled by or to fall asleep to. 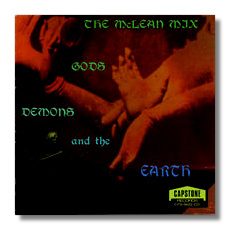 I admit that one afternoon I tried dozing off to one of these CDs, and woke up startled by the challenging sounds that were coming out of my speakers: did my house need an exorcism? Again and again, The McLean Mix comes up with awesome sounds and textures – and I mean "awesome" quite literally. Even though this is modern music that places communication with a non-specialist audience high on its agenda, listeners will get no free rides from it. They'll have to put aside their prejudices and hear it for what it is. These discs have a refreshingly homemade quality that is in tune with the music that they contain; they are professional but hardly slick. The recordings – some of them in concert settings – were made over decades and in many different locations. Nevertheless, the four programs hold together, and the engineering is just fine. If I were to pick just one (and I'm glad I don't have to), I would choose Capstone CPS-8637, which bears the title "The Electric Performer." It strikes me as being the most representative of the four. For more information about The McLean Mix, refer to their website: www.emf.org/people_McLean.html. They also can be reached at McLMIX@aol.com.